Day 3: Multi-storied @ Adelaide Convention Centre | Catalogue This! Colfer spoke on the topic “using young men as the anti-hero”, which was actually him telling stories of his two sons, Sean and Finn, who were right rat bags as children. – Moralising turns kids off quickly! – Boring word choice and expected grammar is boring. – If the heart is not changed, it is no worth writing in the first place. – Children loathed being preached at. – Rhythm underestimated in children’s literature. – Interpretive dance works well with Where is the Green Sheep? This fabulous lady started writing Obernewtyn since she was just sixteen, despite growing up in a house without books. Speaking on the use of fairy tales, her frizzy hair was very fairy-like. She also pointed out the presence of the sleeping beauty legend, mixed into so many of her books, something I had not noticed before. Later on, she was part of a panel on fantasy book, and the value and ethics of their fiction realities. Something she said there that struck a chord with me was that while children’s writers are seen as moral gatekeepers, but that is not why they write. Bella from Twilight might not be seen as a good role model, but why must she be a role model? Why can’t she be as is? Who said that Stephanie Meyer has to make her central character someone for girls to aspire to? After their presentation, each presenter was given a goodie bag as a thank you. 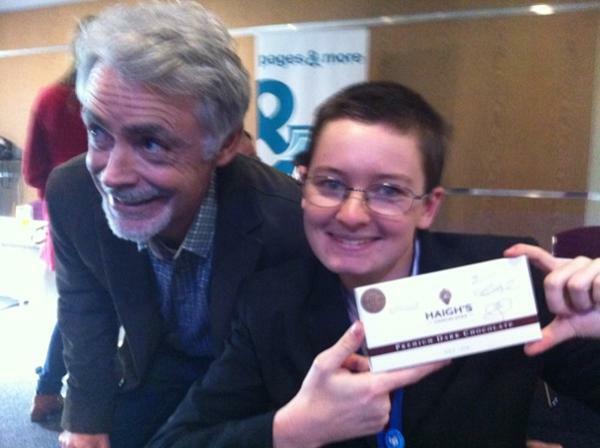 During afternoon tea, Eoin Colfer was standing around, laughing with a group of people, lamenting the face that he couldn’t eat the chocolate in his bag (which was Haige’s Chocolate, which is local, and something South Australians are very proud of). I was passing by at the time, and off the cuff, said “If you have any chocolate going, I would be happy to take it off you hands!” So he did! Not only that, at the prompting of the other in the group around me, he also signed the packet and took a photo with my and the bar of chocolate! Score of the day, that is for sure!